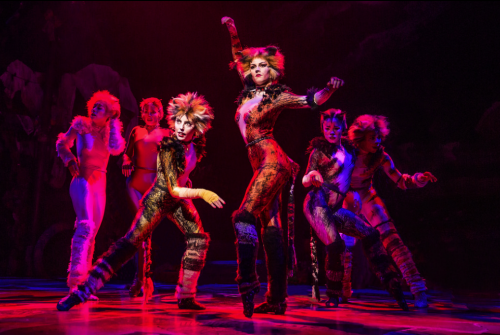 Rediscover Cats —the beloved Andrew Lloyd Webber musical with breathtaking music, including one of the most treasured songs in musical theatre, “Memory.” Winner of seven Tony Awards® including Best Musical. Featuring new sound design, direction and choreography for a new generation — experience Cats for the first time as it begins a new life, or let it thrill you all over again! 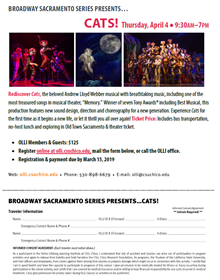 This event is part of the 2018-2019 Broadway Sacramento Series, the region’s largest live performing arts event, featuring national touring productions of some of the most popular Broadway shows and presented by California Musical Theatre at the Community Center Theater in Sacramento. Ticket Price $125: Includes bus transportation, no-host lunch and exploring in Old Town Sacramento & theatre ticket. Due to popular response we have a limited amount of seats left. Please call the office for seat availability at (530) 898-6679.